When I assembled the new bought "Old Fishing Store, Item No: 21310-1" I noticed a very unusual imperfection of parts. 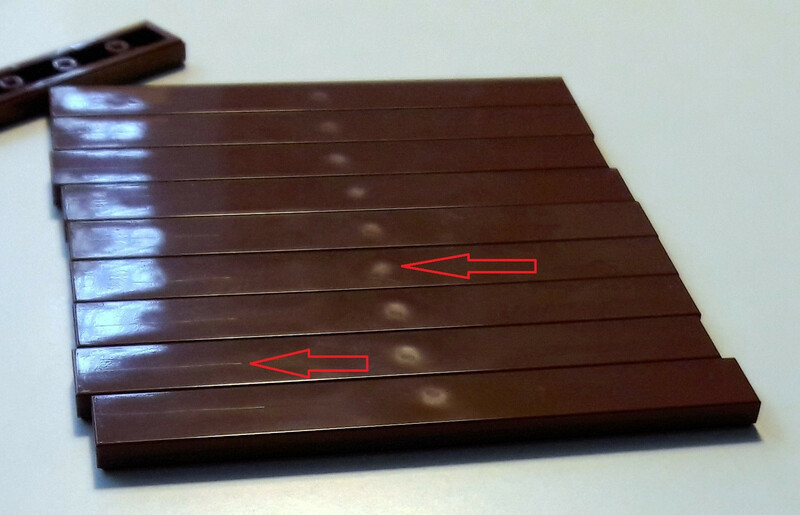 On every of the 43 tiles "1 x 8, reddish brown, Item No: 4162" I found scratches on both ends. Also the injection points I think are much more visible than normal. I contacted Lego and they sent me 43 new tiles. Great, but still the same mistake. I contacted them again and, Lego service being Lego service, again they sent me 43 new tiles. Great again, but still the same phenomena again. So I ended up with 86 additional bricks that I found not fitting to the Lego quality standards that I`m used to. There was also no explanation or comment from Lego service. My question is what is causing this strange scratches? The appearance is not consistent. They are not straight and appear in different strength's and lengths. I have seen this happen with parts originating from older Lego part molds (dies) (like the 16L studded Technic beams in the 42009 Mk2 crane truck). My take is that the molds have been scratched during a maintenance operation but that the mold damage is still within tolerance for Lego. Creating a new mold (die) is very expensive. Not the answer you're looking for? Browse other questions tagged piece-information manufacturing or ask your own question. What causes these 'bite marks' that appear consistently on new bricks? Why are LEGO slope bricks textured? Are there more studs or “antistuds”? Why is there such a small supply of dark red 1x4 bricks? Why is the LEGO IR Receiver V2 not widely produced? Or are they?